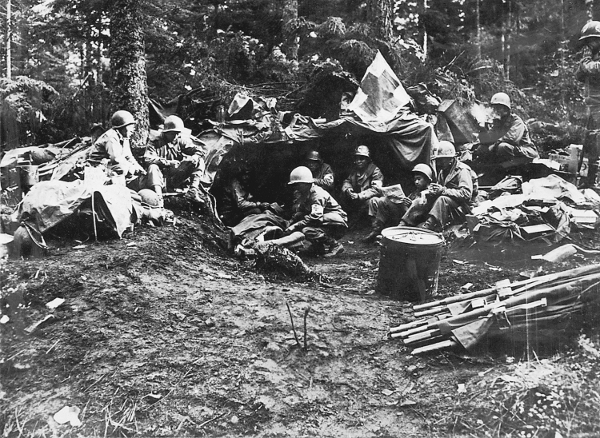 The 100th Infantry Battalion was staffed by a team of medical doctors, medics and litter bearers, who, more often than not, put the welfare of the wounded soldiers above their own safety. When the 100th left Honolulu in June 1942 as the Hawaiian Provisional Infantry Battalion, its medical corps consisted of two physicians, Drs. Isaac Kawasaki and Richard Kainuma and a dentist, Dr. Katsumi Kometani, who was also the morale officer. All three men were about 10 years older than most of the enlisted men. Upon their arrival in Oakland, California, the unit was renamed the 100th Infantry Battalion (Separate) and divided into three groups. Kawasaki, Kainuma and Kometani were each assigned responsibility for one group. Each group then took a different train route that ended at Camp McCoy in Wisconsin. Kawasaki, the battalion surgeon, headed the 100th’s medical team. Both he and Kainuma had extensive prewar surgical experience. They received additional training in field medicine at the Army medical training facility at Carlisle Barracks, Pennsylvania. Kometani was trained in basic first aid. Medics were chosen on the basis of the aptitude they demonstrated in training, while litter bearers were infantry soldiers who were chosen for the task on a an as-needed basis basis. Once overseas and in the combat zone, Kawasaki and Kainuma sustained serious injuries in Italy. Although Kometani’s credentials were in dentistry, he was often on the front lines with Chaplain Israel Yost, helping the litter bearers or assisting Kawasaki and Kainuma in the aid stations. Thomas Murphy In “Ambassadors In Arms” also mentions Captain John J. Dahl as another battalion surgeon In the combat zone before the breakthrough to Rome in May 1944. Medics received two weeks of basic training and six weeks of medical training, plus an additional two weeks of tactical training during which they learned how to set up aid stations and field hospitals. The medics, who carried morphine, iodine, cotton swabs and bandages, were trained to perform three major tasks: 1) provide first aid under fire; 2) recognize and treat wounds; and 3) evacuate soldiers over difficult terrain. They also learned how to assist the doctors during surgeries, plus apply tourniquets, put on splints, and treat minor wounds and lacerations. As Shiramizu had insisted, he was the last of the injured to be evacuated to the hospital. Four days later, he died of his injuries in an Army hospital in Italy. All of the nations fighting in World War II had agreed to follow the rules of the Geneva Convention, established in 1864. Doctors, medics and litter bearers were not supposed to carry weapons on the battlefield. The rules banned attacks on the sick and wounded, as well as on medical personnel and the facilities and equipment that provided medical aid. A universal emblem — a red cross — was adopted for medical missions and all medical personnel wore the insignia somewhere on their body. American personnel wore it on an armband and on their helmet. There were many violations of the Geneva Convention, resulting in medics getting wounded or even being killed. Besides Kiyoshi Shiramizu, other medics killed were: Hideyuki Hayashida, Isamu Ikeda, Masaichi Katsuda, Larry Ochiai, George Sawada and Minoru Tokuyama. Medics such as Satoshi Kadota, Masaichi Goto and Isaac Akinaka received Silver Stars for gallantry, as they continued to treat the wounded while under fire. Because the 100th was often fighting in the mountains of Italy and France, litter bearers in relay teams had to ascend the rugged terrain of the mountains to bring the wounded men down to the aid stations. It was dangerous work that was physically exhausting and emotionally draining. Relay stations were set up along the way where the barest of emergency care was provided, including transfusions of blood plasma and administering an injection of morphine to minimize pain. There were times when the 100th’s front line was so far away from its emergency station that more than 10 four-man litter teams had to be utilized to rescue a seriously wounded soldier. Many of the wounded died not just from the loss of blood, but from exposure. In some cases, the injured man could not be evacuated for a day. In reality, the doctors could not do much more than stabilize the wounded and send them off as quickly as possible to better care facilities and hospitals. The mountainous terrain caused delays, but during the cold and rainy season, the tires of trucks and other vehicles transporting the injured to hospitals would get stuck in the thick mud. The doctors, medics, litter bearers, Chaplain Yost and the soldiers were united in their commitment to save each other’s lives. The 1,703 purple hearts awarded to soldiers of the 100th resulted in the unit being given the nickname, the Purple Heart Battalion. But it was because of the dedication of the 100th’s medical team that most of the Purple Heart recipients were able to return home to their families.